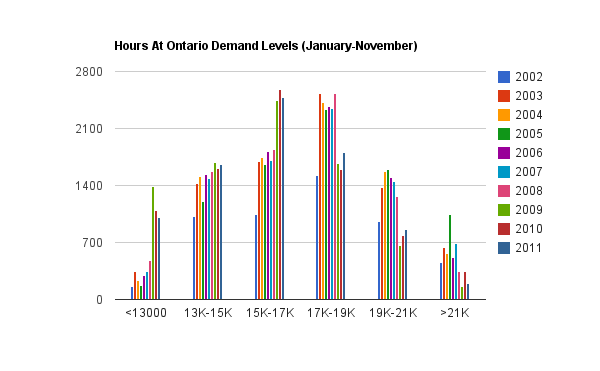 I formatted some data to link the export volumes to both demand levels, and Hourly Ontario Energy Price (HOEP) levels. About 40% of our exports are now made while the HOEP is under $30/MWh. 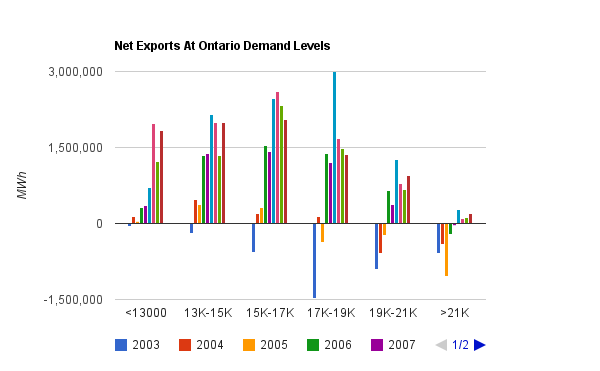 That figure dipped a little in 2010 but is going right back up this year... and this year only 11% of exports are made when the HOEP is over $40/MWh. The realized revenue is apparantly about 10% higher than the HOEP would indicate, as adjacent markets have higher pricing. Nevertheless, it's pretty hard to envision anybody, aside from our Premier, proposing exporting as a good business strategy at this time. The compelling issue for me is the mass of exports concentrated in the $30-$40 range. It seems to me this is because it is the break-even cost range of the marginal capacity, which is coal and natural gas. That is a very low break-even range because we are paying for the coal plants already (they are essentially written off), and we are paying capacity payments, as net revenue requirements for the natural gas plants. This gets real objective - we could call capacity payments subsidies, we could call those green subsidies as renewables decrease the capacity factors of peaking/intermediate generators which makes the capacity payments necessary, or we could call the exports subsidized because the plant is paid for only in Ontario (through the GA). I'm not convinced any of that is as important as recognizing the deep, deep, dysfunction in the market. That dysfunction is we are paying from 3.7 (regulated hydro) and up to over 80 (rooftop) solar for non/low emissions sources, but the marginal supply price is being hammered down by paying the operational costs of the fossil fuel plants. 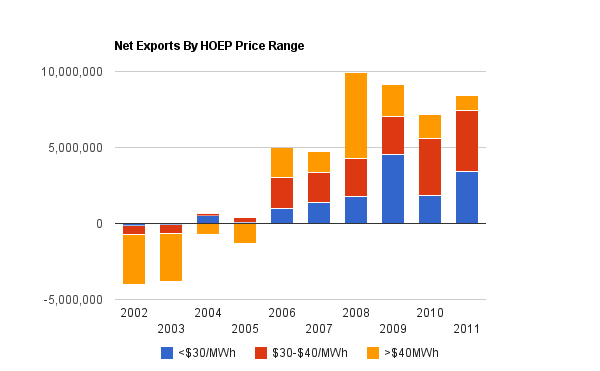 In fairness, up to 2006, when the HOEP was above $40/MWh we were a net importer. Being located besides Quebec, with it's winter peaking and massive storage, I'd suggest we should be importing at high demand periods in the summer - but politically that's not going to be sold. 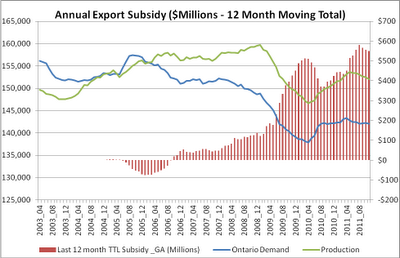 Nevertheless, it can be argued that we may be subsidizing exports now, but we aren't paying for imports. 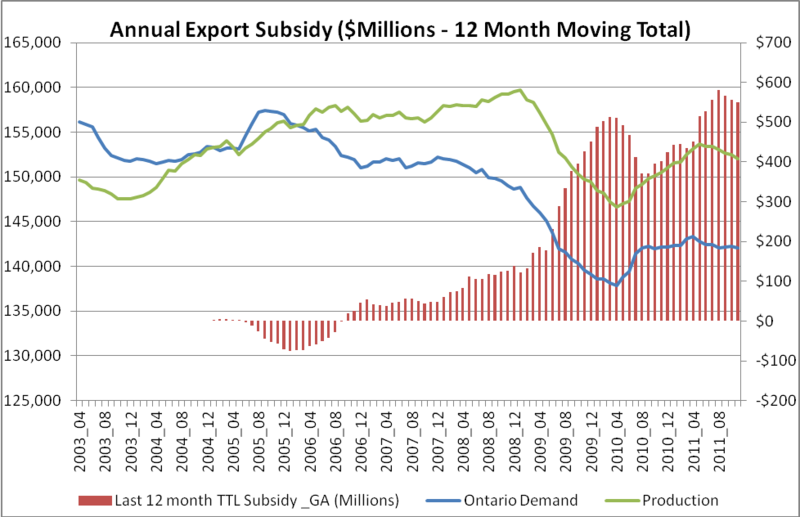 Here's where the 40% of exports done when the price is below $30/MWh illustrate the foolishness of Ontario's developed, and, worse, still developing, supply mix. I think the relevant things are the easiest to communicate. Ontarians pay for a system that is, accidentally or not, designed to export cheaply, so we sell at over half a billion a year less than we'd pay, and ..
Coal and gas are setting the market price in a market presumably designed to eliminate their use (as much as possible). As for whether we'd be better or worse off without exports, I think we'd certainly be better off if we attempted to have a supply mix that didn't require dumping production below a price that included a share of capital, and non-fuel operation, costs. Which is the only real issue here, politics. There's 5 GW of untapped hydro right here in Ontario, at least another 10 in Quebec, and somewhere between 3 and 5 in Manitoba. All of this could be easily piped to the Golden Horsehoe - and some of that Manitoba power was when the contract was axed in 1989. If you look across the country as the whole, there's more than enough hydro capacity to power all of our houses, industry AND our cars (assuming PHEV 40's) - look it up. Building and using capacity would drop our GHG to a fraction of what it is, give us complete energy independence and make us more competitive on the industrial front. So, of course, we're not doing that.